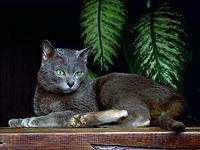 Cats have been the protagonists of myths and legends from all over the world. Some have worshipped them, some have condemned them, and today people are idolising them again, though maybe not with that fervor of the Ancient Egyptians. You may choose to view the whole document simply by scrolling down. Alternatively, you can go directly to the sections that interest you by clicking the links below. NOTE: All these images have been taken from other pages, with the permission of the respective authors. I think it is the least I can do to link their pages. After each section, in fact, you'll find a link or two. Besides that, if you click on the images, it will send you to the page they came from. ...when the Egyptians started identifying the lions that roamed around their land with the Sun. They believed that at sunset, Ra, the Sun God, would die and descend through the underworld in the West, to be born again in the East, at sunrise. During the night, however Ra was always in great danger, as his enemies, headed by the great serpent Apophis would not hesitate to attack him, thus putting the whole Universe in danger. However, the lions would look unto the setting sun, and keep its rays in their eyes, for they, like domestic felines, have eyes that reflect in the dark. With that fire burning in their eyes, the lions would go forth and kill the serpents of the night, as we were going to do afterwards, when the domestic cat was bred in the temples of the Black Land (Kemet, the name applied by the Ancient Egyptians to their country). However, the domestic cat was specifically claimed to be under the protection of Bast. Bast, like Sekhmet was often said to be the daughter of Ra, and she was the protector of cats and those who took care of cats; her gifts were joy and pleasure. Her cult was centred in the city of Bubastis (called Per-Bast, or House of Bast, by the Egyptians), where, once her temple stood. The Greek historian, Herodotus said "there is no temple more beautiful than that of Bubastis". Bubastis also housed a necropolis where hundreds of mummified cats were buried. She also had an annual festival, which seems to have been one of the most popular in the whole of Egypt, accompanied by loud music and chanting. She is often represented either as a woman with a cat's head, or as a cat. The significance of Bast can only be understood by comparing her to Sekhmet. Indeed, there is evidence that the Egyptians viewed them as aspects of the same divine force - Sekhmet being the violent aspect of the divine sun, and Bast being its gentler aspect. The quote above also sheds light on a popular concept amongst Egyptian women seems to have been that the ideal beauty was that of a cat. The make-up they used accentuated particular features, especially the eyes, which gave them a mysterious cat-like look. Often children were consecrated to Bastet - a cut was made on their arm and drops of cat blood poured into it. A marble coffin of a royal cat refers to the cat contained inside it as "Lady Cat". A human who killed a cat, even accidentally, was put to death, and when a cat died, the owners used to shave off their eyebrows as a sign of mourning. In the tomb of Tutankhamun, the image of a serene Bast was found on a gilded shrine, housing the royal coffin. One of the discoverers of Tutankhamun's tomb, Lord Carnarvon, is said to have become interested in Egyptology after discovering a cat coffin. The increase in internation trade with Ancient Egypt, especially by Phoenicians and Romans, spread cats to other lands, from Egypt to Europe and Asia. In these countries, cats have their own stories too. In the meantime, the domestic cats in Egypt are still highly respected, for in that land, the bond between cat and human is now eternal, with cats walking among the streets in the market place, where till today, the images of Bast are still being offered to tourists, as they must have been offered once, a long time ago, to pilgrims, who would have been going to the annual celebration of Bast! Want to learn more about Bast? ... cats were associated with Freyja. The name Freyja (alternatively spelt Freija, Freiya, or Freya) means 'the Lady', and she is the mistress of magic (her particular form of magic being called Seidh, a system involving trance and very similar to shamanism). The day Friday is named after her. 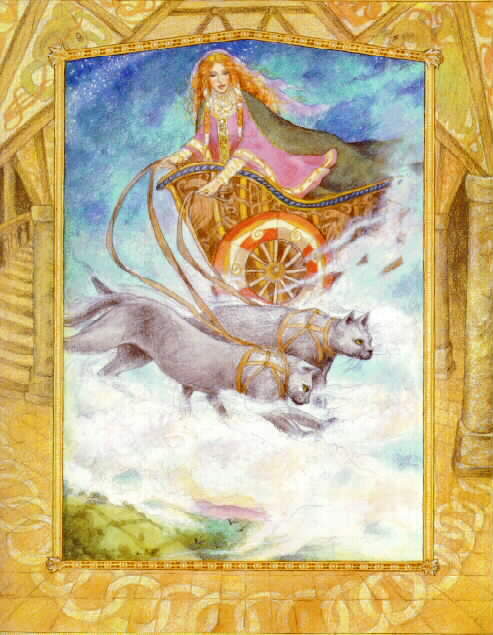 Her personal transport is a magnificent chariot, drawn by two large grey cats. "And the witches! Never to be forgotten! Later history is marked by a very dark craze, centering on a phenomenon popularly called 'witchcraft'. The classical stereotype of the witch in our culture and folklore has come to be an old woman, possibly with green or gray skin, wearing a pointed hat, clad completely in black. She possesses a flying broomstick, and a black cat. But what is behind this myth? First of all, the 'witches' involved in the witch trials included a variety of people. While our concept of the witch is as an old woman, the 'witches' which were put to trial included men, young women and horribly enough, children, though the vast majority can be said to have been adult women. The traditional black cat accompanying the witch derives from the tradition that a witch would be given a 'familiar', that is an animal helper from the Devil, to help her in her magical workings. Most of these familiars would have a name (just like ordinary pets) but the very natural fact of giving a loved pet a name and occasionally talking to such a pet was already an implication that one is involved in 'witchcraft'. Most might recall that one of the witches in Shakespeare's Macbeth calls her cat Grimalkin, (Gri meaning 'grey'; and malkin meaning 'cat' but also meaning promiscuous or eccentric woman) ; an actual case from a witch trial concerns a cat called Pyewackett. According to Matthew Hopkins, the Witch-finder general, this was a name 'no mortal could invent'. The name might be familiar to some from the movie Bell, Book and Candle. Another instance of the oppression of cats was in the downfall of the Knights Templar. Under torture, the Knights Templar were compelled to confess to heresy, renouncing Christ and, in some instances, the worship of cats. It is debatable whether these confessions tell us more about the practices of the Knights Templar, or rather, whether they speak more loudly of the popular conceptions held by Church officials of the time. Another explanation (though highly questionable) of why black cats are often associated with witches and the Devil is this. The "blackberry" cats are often born at the end of the blackberry season, which according to legend is the time of the year in which Satan was thrown out of heaven, landing on a blackberry bush which he then defiled with his urine and spittle. In the late 19th Century, folklorist Charles G. Leland wrote about groups of women around Italy, known as streghe ie. witches, who still worshipped the goddess Diana, deity of the moon, and in this Italian tradition Leland was writing about, was known as 'the Queen of witches'. Her brother, who in classical mythology was Apollo, is here called Lucifer, which though not without references to Christian concepts, means 'light-bearer'. In trying to trick Lucifer to conceive a son with her, Diana takes the shape of a cat. Much irony has come from these historical instances. First of all we find conflicting versions of black cat superstitions. Some groups (especially Southern European countries) tend to associate black cats with bad luck; others (especially England) attribute good luck to the same animal. Secondly we find that the mass-burnings of cats led to a very unhappy fate - the proliferation of rats, which not only decimated food resources, but acted as the carrier of illness, the culmination of which was the Great Plagues. Finally, it is interesting how several people have re-interpreted the concept of 'familiar', and feel that their pets are indeed helpers of a sort. This is coupled with a growing interest in what was once termed witchcraft, and what was once the Order of the Knights Templar. A modern perspective on familiars. Joan's Witch Directory - a good historical resource. ...are considered to be very clean animals. The Prophet Mohammed is said to have kept cats himself, and popular legend tells that one time, the Prophet had to respect the call to prayer, but his cat was sleeping on the sleeve of his robe. Rather than awake the cat, the Prophet simply tore his sleeve, and went of to prayer. the legend of the Birman takes place in a temple built on the sides of Mount Lugh, in Burma. The temple housed the golden image of the Goddess Tsun Kyan-Kse. The holy Kittah (monk) Mun-Ha was head monk. The God Song Hio himself braided Mun-Ha's beard with gold. Mun-Ha always used to meditate in front of the Goddess with the sapphire eyes. The Goddess Tsun Kyan-Kse made sure that the Kittahs would be reborn as an animal for the duration of a life, after which the soul would be in Nirvana (the heaven beyond illusion), shining with a golden halo. Accompanying him in his meditation was Sinh, a white cat whose ears reflected the yellow of the golden Goddess and the golden beard of his master, and whose nose, tail and paws were brown like the earth on which he stood. As the moon shone, one night, Mun-Ha entered a transcendental state which was so deep that he felt no pain when Siamese invaders murdered him. Sinh placed his gentle paws on the monk's robes. Facing the Goddess, Sinh's fur became gold, like the golden statue before him, and his eyes became the beautiful blue shining eyes of the Goddess. His legs, his tail, his ears and his face became a velvety rich brown. His paws, which were gently laid on his master's body became a purest white. The Kittahs, though in a state of panic due to the invasion, obeyed Sinh's commanding but serene look, and closed the heavy bronze doors of the temple, thus saving it from the invaders. The next morning, the remaining ninety-nine cats had been similarly transformed, and thus the Birman breed has its origins. Sinh did not move from the place of his master's death, and exactly seven days after, he died, carrying with him the soul of Mun-Ha, which it was his duty to present to Tsun Kyan-Kse who would reward him with Nirvana. On that same day, the priests were arguing about who should succeed Mun-Ha. All the transformed temple cats entered the temple and in complete silence surrounded the youngest of the Kittahs, who was to succeed Mun-Ha. Thus it is believed that when a Kittah dies, he would be reincarnated as a Birman cat before attaining Nirvana. Another belief, according to Major Russell Gordon is this: "But woe also to he who brings about the end of one of these marvelous beasts, even if he did not mean to. He will suffer the most cruel torments until the soul he has upset is appeased." "The Birman Cat (The Sacred Cat of Burma)" by Vivianne Smith. too has it's own legend. 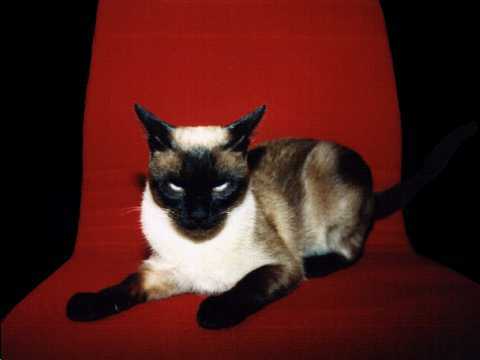 It was said that when Siamese kings died, their souls would pass on to a Siamese cat, so that he could be present at the coronation of the succeeding king before attaining heaven. This cat would have been treated as part of the Royal family, and would have resided in the palace. 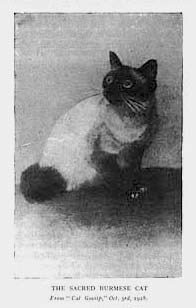 Besides that, there are some Siamese cats who have a kinked tail and who have yet another legend. They're considered auspicious in the Far East, and legend has it that an ancestor of this breed voluntarily kinked it's tail so as to provide a safe place for the princess' rings while she was bathing. She used to slide her rings along the cat's tail, and there was no danger of them being lost, as the kinked tail prevented them from falling. Of course, if the cat ran away, it would be a different story, but if a cat is so faithful so as to kink his/her tail, try picturing him running away. like dewdrops on a lotus leaf." Rather unlike the royal Siamese, they are linked with the farmers, who to induce rain carry one of our kind in procession, while they themselves chant and pray to the sky gods. After the procession, the water is sprinkled on the cat's face so as to induce rain. ...where we find the origins of the Beckoning Cat, or the manekineko as he is called in Japan. This cat, long long ago, stood in the door of the Gotoku-ji temple and raised her paw in the traditional Japanese beckoning gesture to a feudal lord who was passing by. The feudal lord followed the cat into the temple and instantly, a lightning bolt struck the place where the lord had been standing. Thus the cat had saved his life. From then on, the manekineko was considered as an incarnation of the Goddess of Mercy. The Gotoku-ji Temple now houses dozens of statues of this Cat, and owners of lost or sick cats stick up prayer boards with the image of the Beckoning Cat in this temple. 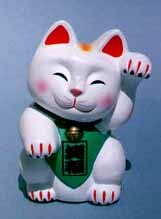 In business the manekineko is said to bring success. This is because her raised paw beckons in customers. It also welcomes in personal happiness and harmony. A black Beckoning Cat brings health, while a gold one, which is quite rare, brings in riches. 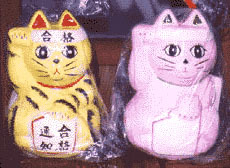 Beckoning Cats are often sold as money boxes and in a house they are supposed to beckon in good friends. All photos except the one labelled "Manekinekos in cling film" were provided by Catseye Creative Services, whose website was available at http://www.2cowherd.net/catseye/ but seems to be now defunct. ...have been the subject of many folk legends. Such legends are not as well established as the previous mythological accounts referred to. Nevertheless, they are not less interesting. According to one of these, at the time of the flood, Noah took pairs of rats and mice too. However, the rodents multiplied very quickly and the Ark was, after a while, infested by rodents. Noah consulted the lion, who as king of the beasts may have known a solution. The lion sneezed and from his nostrils, a pair of ready made domestic cats came out, who instantly set down to work, having a natural instinct for being "verminators". Sometimes, it is said that God created the cat, but that the mouse is the Devil's work. The Devil's mouse set out to destroy all life forms by gnawing a hole in the Ark. However, God's cat saved the day by killing the mouse, and a frog crept in the hole, thus getting it's amphibian tendencies, by being in contact with water and dry wood simultaneously. Yet another Noah's Ark cat legend is that of the Manx cat, who has no tail because it was unpunctual in its arrival to the Ark, and the careless Noah closed it's tail in the door of the Ark. Well, after all he was only human, ey? ..., when the ancestral spirits sang the world into existence, there was a cat-man called Ngariman. The Bagadjimbiri brothers, that is the Creator Gods of Karadjeri tradition, travelled far and wide while creating the world. One of the strange things they saw was Ngariman, the cat man, who in their eyes was so funny that they were paralysed with laughter. Ngariman was offended, and together with his relatives, killed the brothers. The Earth Goddess, Dilga was moved by this scene and from her breasts a torrent of milk flowed which drowned Ngariman and his relatives and revived the Bagadjimbiri brothers. However Ngariman was probably not a domestic cat, as those arrived in Australia around 1785 from Britain (though some may have arrived earlier from Indonesian ships). Rather, he was probably a native Australian marsupial cat (Vasyurus Maculatus). ...concerning cats are the following: In the Ozark Mountains of Tennessee and Arkansas, a girl not knowing what to answer to a marraige proposal would take three hairs from a cat's tail (ouch!) and put them in a folded piece of paper, which she placed under her doorstep. She would answer according to whether the hairs formed an "N" or a "Y". A cat on a grave meant that the buried person's soul was in the possession of the Devil, and if two cats were fighting on a grave, this signified the Devil and the defunct person's Guardian Angel fighting for his/her soul. In the early 16th century, a visitor to an English home would always kiss the family cat. In Ireland, however, a black cat passing infront of you by moonlight foretells death by an epidemic.